We have used our cover for 7 months now and are completely satisfied. Best cover we have ever had. I LOVE my new spa cover! The Teal is beautiful, the whole thing is Excellent! I am thrilled and will tell my friends who have spas! Thank you for your Help. The cover looks Great. The Quality is Great. Would not hesitate to order again from you all. And tell all my friends about you all. Got my cover delivered yesterday. Looks great, fits good. Tell everyone involved, that I am very happy with my experience with affordable spa covers. And will recommend you to my hot tub friends. Hello, just received my new spa cover and wanted to drop you a note with my thoughts. First of all the cover fits perfectly in every respect. It looks great on the spa. When I shop for anything I don't shop price, I shop quality. I'm happy to say I am completely satisfied at this point with the quality and appearance of the cover. I purchased all the upgrades for my cover and happy I did. My old cover was heavy and water logged, it's great to have a light weight cover now. I was a little Leary on purchasing this as I have a cover lifter that screws into the side of the cover and wanted to be sure the cover would accommodate my cover. Happily the new cover came with a note indicating on which side to screw the mounting brackets. I used the self tapping screws and the cover lift went on quickly and easily. My compliments to your company for producing a quality product. I hope this will last. Thanks again and have a great day! Our spa cover just arrived and we love it. It fits perfectly, the color is wonderful, and the quality is great. We were a little nervous ordering a cover online. We ordered from you based on the offered features, website ease of use, low price, and online recommendations. We are so glad we did. Delivery was just as promised and the delivery service people were great. We are so pleased with our cover. Thank you! There's not really too much to say, other than: Quick delivery. Good price. Fits great. Well built. The color is perfect. The folks are decent to speak with. Doing business, especially online is sometimes a bit "sketchy" but, I have had few purchases that met all my needs and budget. It really doesn't get too much better than this! I will certainly recommend them to friends and family and i usually never do that! Affordable Spa Covers is a wonderful company with which to do business. They took every possible care to see that I got exactly the cover I needed. They were responsive to my every question and helped me through the process of measuring to ensure a proper fit. So: courtesy and a great product. Couldn't have asked for more. I wish they could give lessons to the business community on how to treat customers! Ok, So I needed a new hot tub cover, I learned very quickly there is a lot to learn about hot tub covers. Vinyl weight,foam density,plastic wrap thickness etc.ect. Mine is for my beach house in NC, a few hundred feet from the ocean and.....its a rental property, the cover needs to take abuse from people who don’t care about it. First,there are many company’s that do covers, all have mixed reviews. Shipping being the biggest issue across the board. So,I started with who made their covers in the USA...A.S.C Next, who used/offered the best material that are being used...A.S.C I spent about.....20hrs online going through every hot tub maker (no lie), read many many reviews. I chose A.S.C. 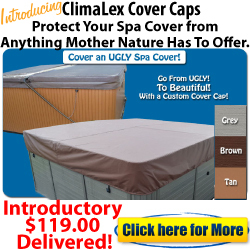 (Affordable spa covers) I was confident they had he best equipment for the same or better price. I went with the “walk on cover” so worth the money. My concern was shipping, read a lot of reviews with shipping issues, from every company. I’m here to say they made exactly what I asked for, the quality was great, better than I expected with a few things, the handles on mine were the top of the line rubber grips, definitely extra cost elsewhere, and the full length steam stopper, also included at no extra cost on mine, very thick, seals nicely. I paid for the expedited assembly and shipping, it went off without a hitch !!!! !made as fast as they said, arrived when they said They updated me as to where in the process my cover was as far as assembly, and when it shipped out. When I tracked it, they let me know where it was and when it was coming in. The driver txt me when he was 10 minutes out to ask if I was around for delivery. When I took it down to the house to install it, it fit perfectly, zero issues. I know this is long winded, but it is what I was looking for to help me decide who to go with. I am not affiliated in any way with A.S.C,they haven’t even asked me to write this. I will tell everyone I come across that needs a cover to shop here. Just a guy who wanted the a great cover. Received cover today! It fits perfect and looks great!! Thanks so much!! Dear Affordable Spa covers owners and staff... I received my cover on Thursday and I absolutely love it!!! Great job. My spa cover just arrived. It fits the unusual contours of our spa perfectly and it is beautifully manufactured. The color is also exactly as expected and the light weight is a real treat. I will certainly be recommending you guys to friends and family. Thank you!! This is June in California. I just had to drop you a note and thank you so very much for my new hot tub cover. It is beautiful, and everything I hoped it would be. You were so nice to me when I called to check on my order, as I am not very good with computers. Everything, from the moment I ordered, to tracking, to delivery, and again speaking with you by telephone was just great. Thank you, thank you, thank you. You and your company are the best!!! I will be recommending you to everyone!!! We received our spa cover yesterday in perfect condition. Today we cleaned the hot tub and put it on. It's a perfect fit just like the last one. We could not be happier with the appearance and quality. Once again it has been a pleasure doing business with you! The cover fits like a glove! The color is absolutely perfect! It ties in the blue color in our pool tile. Thank you very much! Received my spa cover today. It's perfect. Very pleased with every aspect from order to delivery. Thank you. I received the cover on March 15th. It looks great & is a perfect fit. Although the straps were not in same place as my previous one, I was able to tilt the clamps to make them work. Thanks for the great looking cover & the fast turn around in getting it delivered. I just wanted to say that you guys ROCK!! I placed my order 11/29/15 and just got it today 12/7/15 and it is PERFECT!!!! Great company to work with. Thank you so so much for the excellent communications, product and pricing!! I am totally impressed with the ease of ordering from your site, the prompt delivery and most important the quality of my spa cover. Thank you affordable spa cover for providing such a quality cover at an amazing price. I'm blown away by your service and the actual product. Certainly a quality spa cover. Way better than the one my spa originally came with. I will definitely spread the word to anyone looking for a spa cover. Thank you. Wow, that was quick. 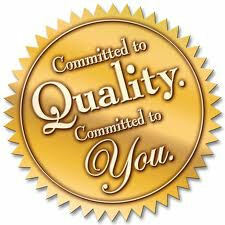 We are so completely satisfied with the quality and service. We'll definitely recommend your establishment. Just wanted to let you know we love our new cover it fits and looks perfect! Spa received in perfect condition at time stated by shipping company. Great job, Affordable! You had my "Spa Cover'ed' " Thanks. The spa cover arrived this morning and is gorgeous. We are pleased with the color, the fit and the workmanship. Thank you for what appears to be a very fine product. We received the spa cover today an hour early than projected. It is in perfect shape. Fits great. Thanks!! Our new spa cover arrived yesterday, and we are VERY happy with it. It is a perfect fit, and looks to be better quality than the one it is replacing. The first cover you sent was damaged, thanks for sending a replacement so quickly. Rec'd my spa cover last Thursday. Thank you for the prompt service....I must say, the huge ' Semi trailer’ delivering the purchase was a surprise. He was a very professional and experienced driver to maneuver through this one street subdivision. Just had to write and say how pleased I am with your spa cover. I ordered it in Oct. 2011. Your cover looks as new today as when I purchased it! Quality and color is perfect. 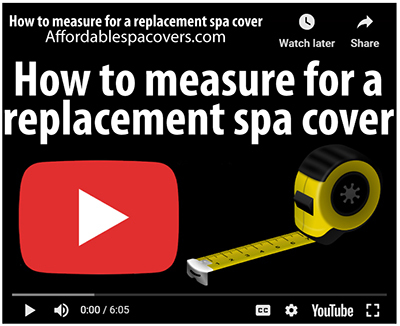 I measured our Hot tub myself using your easy to follow instructions, end result is a great fitting cover. We were also very pleased with your delivery service. Product arrived when promised. Thanks again for your product and service, well done!! Just a quick note to express my delight in the cover I received this past week. It fit perfectly and looks terrific! The quality of workmanship is excellent and the cover looks great on my spa. Thank you. Just received our new cover, PERFECT FIT, TOP QUALITY! Thank You. THANK YOU! Cover arrived in perfect condition. Already covering the spa too! Quality is even higher than expected. Thank you again! I just received my spa cover, Order ID: 19265. I am very satisified and I wanted to let you know that i'm really pleased with the quality of this cover. Thanks you very much! Absolutely AWESOME PRICE and SUPURB product! We bought the 6” to 4” taper with upgrade to 2lb foam inserts as well as double wrapped. We were so impressed by the fast service, we ordered it on 10/14 and received it on 10/23. 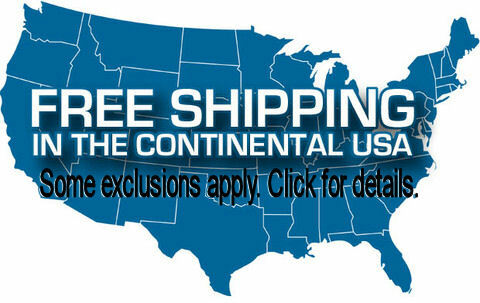 – Oh yeah and (FREE SHIPPING).....You guys are awesome! Just thought you guys would like to that we have referred you to all our friends that have hot - tubs and they as well as us will definitely be ordering again from you in the future. Thank you. Cover arrived yesterday it looks great and is a perfect fit. I'm very happy w/ the cover. Just wanted to say thanks for a good job on my cover it fit great and look great thanks again. This hot tub cover is beautiful! Thank you such a pleasant experience...it fits perfect, its gorgeous, fast service and the delivery guy was very nice and helpful. So tickled! Shannon H. Good Morning, Thank you! So far, very nice! Fits perfect! We love the lightweight, yet solid construction. It makes our hot tub look brand new! The cover is BEAUTIFUL! Fits like a glove, your measuring tools and tips were easy to follow and understand. The new cover is so much better than the original I wish we would have purchased the replacement sooner. I will Share your Website with others on Facebook! Hello I would like to say thanks for the great Hot Tub Cover. This cover fits like a glove and is very well built. The steam stopper is incredibly rigid and supports the middle with a nice raised bevel. I have purchased a lot of Hot Tub Covers and this is definitely the best design with quality materials. Hello, I received my cover and it looks beautiful!! I'm glad I found you guys online. Thank you. WOW! AWESOME! THANKYOU! Y'all communicate well, kept us in the loop during the whole process. Got our new hot tub cover today...ordered Sept 19 and it arrived today (10 days!) in PERFECT SHAPE. The color is awesome... we are repainting out deck and hot tub and this cover color is fabulous... really going tpo punch up our deck.. Y'all get a AAA+++ rating for us! This cover is wwwaaayyyy better than the cover we had purchased from a local hot tub store years ago... made better, heavier, nicer fabric, thicker... can't say enough nice things. THANK YOU! I received my spa cover and I LOVE IT. It fit perfect!!!!!!!!!! I also love the color I chose. Thank you for your great customer service and the excellent quality of the spa cover. Also, I would like to give Stacey a 10 plus for her kindness, professional, knowledgeable and help while I was trying to get the right measurements to order. I also was going back and forth on choosing a color. She helped me with that too, and I love the color. Your company is Blessed to have her. Her customer relation skills are the best and I know that is hard to find.